In a 21 page planning report on a planning application for a fire station in Saughall Massie, councillors on the Planning Committee have been recommended to approve the application. The report fails to mention that Wirral Council owns the land, and following a First-tier Tribunal case between myself and the Merseyside Fire and Rescue Authority, it was revealed that Merseyside Fire and Rescue Authority had set aside £300,000* to pay Wirral Council for the land as part of the project. Merseyside Fire and Rescue Authority also predict they will receive £200,000* from the sale of West Kirby fire station and £350,000* from the sale of Upton fire station. Updated 16/11/2016 *estimates of sale prices for Upton Fire Station, West Kirby Fire Station and the land at Saughall Massie owned by Wirral Council were made by Merseyside Fire and Rescue Service to Merseyside Fire and Rescue Authority based on prices in October 2014 (Upton Fire Station and West Kirby Fire Station), see Appendix H to Merseyside Fire and Rescue Authority report CFO/101/14) and January 2015 (Upton Fire Station, West Kirby Fire Station and land at Saughall Massie, see Appendix F to Merseyside Fire and Rescue Authority report CFO/003/15). When Wirral Council’s Planning Committee meets next week on Thursday 10th November 2016, starting at 6.00pm in Committee Room 1 at Wallasey Town Hall, Brighton Street, Seacombe it is expected that a site visit will be requested which will delay a final decision to a later meeting of the Planning Committee. 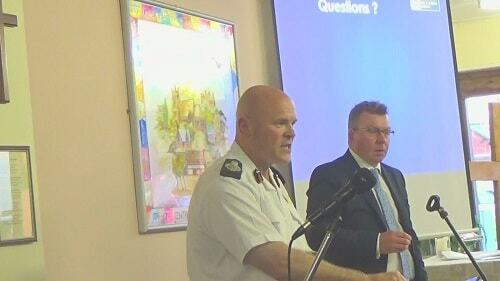 At the last Merseyside Fire and Rescue Authority meeting, Chief Fire Officer Dan Stephens (pictured in the photo above) indicated that he wished to speak at the meeting when the planning application is decided to explain what he sees as the very special circumstances as to why the planning application for a fire station in the greenbelt should be approved. As the planning report details, there are three petitions of opposition to the planning application (totalling 2,561 signatures), 600 online objections and 524 letters of objection to the proposal. The Planning Committee is supposed to not be subject to the party whip though, so councillors can make their own mind up without taking into account party political considerations. What’s £300,000 divided by 65? Even with the purchase of the land at Saughall Massie from Wirral Council, the sale of the other two sites and the £1.5 million government grant, the Merseyside Fire and Rescue Authority need to find close to £2 million of their own money to pay for the new fire station. Not much for destroying our countryside,Merseyside Fire seem to be in Scrooge mode! I think if a fire station can be classed as “very special circumstances” they they won’t find it hard to recommend Hoylake Golf Resort for approval! They will only get £550.000 if and when they sell the land on these two sites, if no one wants it it worthless! You’re right, although I would guess that it wouldn’t be hard to find a developer for the West Kirby and Upton site who would put in requests for planning permission for housing. I spoke at the 1996 UDP public local enquiry about the Saughall Massie by-pass. I objected to the by-pass on behalf of Wallasey Civic Society. I told the Barrister that we were worried that once the road was opened up, it would open up opportunities to access the surrounding farmland for development. Developers were already objecting to Greenbelt being retained in the 1996 UDP sp the pressure has never goine away. Anyway, the council’s hired barrister said I was talking a load of s*** and fobbed me off in the way that barristers do to idiots who try and argue with them. Funny how Dan’s ideal response times can now be achieved thanks to the by-pass wheras back in 1996, there was no chance of throwing around a fire engine at speed down those lanes. Seems like I wasn’t talking s*** after all. Well twenty years later there are still restrictions on development in the green belt. The trouble is “very special circumstances” is so arbitrary! Trouble is councillors on the Planning Committee can ignore their own policies on the green belt if they wish to! If you read through the Merseyside Fire and Rescue Service stuff you’ll find that Saughall Massie was never their preferred location anyway and if they had a free hand in where it went they preferred Three Lanes End. From a planning perspective, there would have been very little (if MFRA had realised they did have compulsory purchase powers) that Wirral Council could’ve done to stop it at Greasby. They just ended up with it because they conveniently thought they didn’t have compulsory purchase powers (which they do). Once they finally agreed they did have compulsory purchase powers they decided that they didn’t apply to land owned by Wirral Council (again incorrect). Then they decided (for whatever reason) to only consider seriously land held by Wirral Council. What did Merseyside Fire and Rescue Service get the £1.5 million in grant funding for a fire station here? Well the government won’t tell us until they get planning permission! At the last Merseyside Fire and Rescue Authority it was explained that per a thousand people Wirral has the highest fire deaths of any area on Merseyside. therumdoctor’s comments about the barista cheered me no end in regard to “Highbrow” sitting the smug, smarmy overly polite barista in his mate’s case right back on his overfed and overpaid arse last week. If you can prove your case and be as eloquent as “Highbrow” they can only beat you with the low life deceit they play with each other. Wish you had got it on filum John to show potential whistle blowers. You should know by now James that a citizen may try to take on the state in the courtroom, but the state will try to make sure the decision making is tilted in their favour. Talking of “Highbrow” I just saw he is chasing that Big fund list of recipients via FOI. Why oh why do they just keep wasting money John. Openness honesty and transparency is what they say. Despite saying ad nausea we have lessons to learn lessons to learn they are just too thick or just blatantly dishonest. Because as far as they’re concerned it’s not their money! Direct action is what’s needed here. You’ve gotta make a real political point rather than, as we do, over and over again, gibbering on from the sidelines and having absolutely no influence at all upon the final outcome. Join me. Follow me. Tell those that are in a position of influence that you, a tax paying member of the public refuse to be saved by Dan. That’s right, as foolhardy as it sounds, if your laid in bed tonight minding your own business and the mattress suddenly becomes a flaming blaze, you phone the emergency services and ask for the Firebrigade. Tell them who you are, where you live and where you are in the house. Then, just before you end the call because your bloody duvet has ignited the curtains, you tell them, ‘don’t send Dan. If he’s the one up the ladder banging on the window shouting, ‘I’m here to save you’, I’m not leaving. I’ll take me chances with the fire and smoke before I let Dan take credit for saving my life’. Course, nobody will because nobody takes any bloody notice of me!